I'm still on the juicing kick. I usually don't last with things for more than two weeks. I have a feeling since my hubby's doing the green juice thing with me, it staying on as a staple in our home. I really enjoy making the drink together with him every night. It's a new kind of together time. I was walking on campus this week. Taking the view around 5pm each day is breathtaking. Yesterday's sky (my phone pics don't do it justice) looked like God painted the sky in pastels. Such beauty. The roses right before I crossed the street made me stop. 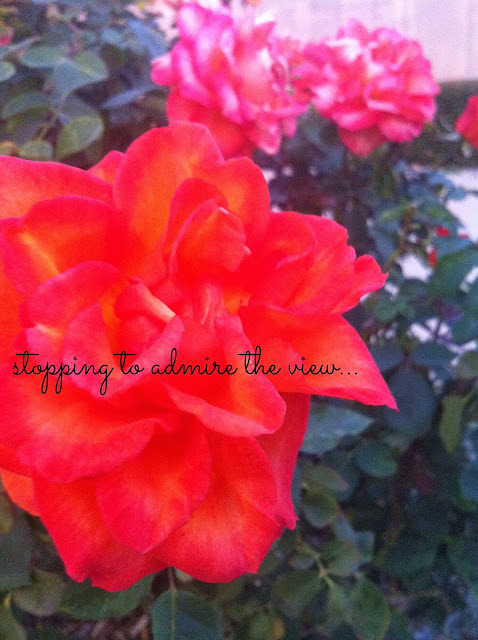 Admiring the view is something I forget to do each day. Yesterday I whispered "thank you" for all the little big things He shows me. Because without coffee my weekday just isn't complete. Fun fact: I don't really drink coffee on the weekends. It's pretty rare. Weird, right? I've kinda been at a loss for blogging words this week, but thanks for still sticking around. Let's hang out next week again, k?! Have a wonderful weekend, lovey! Want to meet some other fine and wonderful bloggers? Go have some coffee with Alissa! I have never done juice at night. I always do it (when I am on a kick) in the am. Maybe I should try this to keep me from snacking on halloween candy!